When we left this story, last week, the badly injured Donald Downs was about one thousand vertical feet below, and south of, Forester Pass. Ranger Sam Clark had telephoned for help, and a rescue team, including a doctor, was on its way. Ranger Clark got a little rest, and then returned to Crabtree Meadow and to George Carey. Once united, they both walked and rode (they shared a horse) back to the trail camp where Downs and the other injured men were camped. By the predawn darkness on Thursday morning they were in the vicinity of the accident. Finally, about thirty minutes after sunrise, they found the camp where the injured men were waiting. Photo courtesy of “Rsweiner” via Wikipedia. Clark took charge; he had the men build stretchers, assessed who could walk and who had to ride, and dispatched Carey: his mission was to meet the rescue team and to guide them back to camp. In the meantime, east of the Sierra Nevada, twelve rescuers had been assembled, including a Dr. Morton W. Fraser and a nurse by the name of Lawson. They moved quickly, from the south, towards the injured. By the afternoon of Friday, August 29th–three days after the accident–Carey and the rescue team converged, probably somewhere on Diamond Mesa. A few hours later they arrived at the trail camp. A quick triage by Fraser revealed that Donald was in the worst condition. With three days to fester, gangrene had already begun to infect the arm. An amputation was required. Within a couple of hours after sundown the arm was gone, all the way up to four inches below the shoulder. In the morning they broke camp and began to move. Three of the injured, including Downs, were non-ambulatory, so the stretchers built earlier came in handy. The fourth injured man could at least ride a horse. They headed south, again over Forester Pass, towards Tyndall Creek. There, at a place called Baxter’s Cabin, they settled in for the next phase of the rescue. The rescue team were not the only people moving towards Baxter’s Cabin. From the east, Donald’s mother and an additional nurse, named Moore, were heading there as well. It’s not known what the authorities told Donald’s mother, but whatever it was, she set out within twenty-four hours to come to the aid of her son. By late Monday Fraser believed that he had to remove more tissue, but he felt unable to perform the shoulder resection on his own. He requested additional medical help, and a Dr. William Adams, of Fresno, started to make his way to Lone Pine for the eventual trip to the cabin-turned-hospital. At 2:04 a.m. on Tuesday, just a little less than a week after the boulder crushed his arm and shoulder, Donald Downs died–most likely from the infection. His mother was at his bedside, and a contemporaneous report says that he was in good spirits almost up until the end. 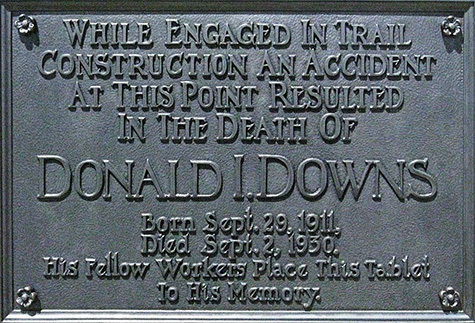 Donald has been gone for nearly a century, but a plaque along the trail remains. Although I was unable to determine when it was affixed to the boulder where it is now displayed, all indications are that it was sited there within a year or two of Donald’s death. It’s almost impossible to miss if you are traveling north, but it’s difficult to find if you are heading south. Thus, most John Muir Trail thru-hikers probably never encounter it. I was hiking northbound and it was easy to see. But since it is so easy to miss in the opposite direction, I recorded a GPS waypoint for it to share with others. It’s here on a Google map and if you switch to satellite view and zoom in you can see the boulder it is placed on. Copy and paste the URL into your browser’s address bar. Thanks, John. Terrific link! Pretty amazing that you can actually see the boulder on which it’s mounted.